As the City of Victoria prepares to officially open its second dedicated bike lane on Fort Street, it seems not everyone is ready to accept the new addition. The street has been under construction since September as crews constructed a two-way separated bike lane like the one installed along Pandora Avenue last year. Some businesses along the route worry that a loss of parking to make way for construction is driving loyal customers away – and fear it won't let up even after the lanes are finished. "People that like to come down on a regular basis aren't coming down as often because there's just so much going on, and parking's an issue," said Jack Schaddelee, who runs Dutch Bakery, a business on Fort Street that goes back three generations. "So a lot of of those people are going to say I don't want to go downtown, it's just a hassle, I'm just going to stay where I am." That same concern was echoed a few blocks down the street at Little Jumbo, a restaurant and cocktail bar on lower Fort. Owner Bruce Gillespie said his businesses has been forced to reduce staff hours and cut costs amid financial concerns. "We did do a decrease in hours, so we knocked off an hour each day," said Gillespie. This week he surveyed other businesses on Fort and said about 30 responded – and that all but one said they've taken a financial hit during construction. "Seeing those survey results, it was just gobsmacking in terms of what it's done for particularly retailers," Gillespie said. 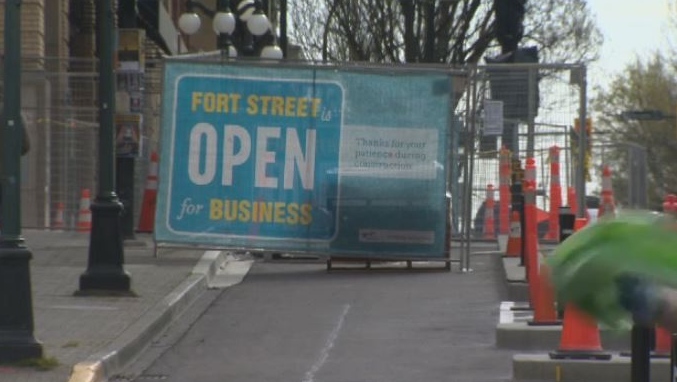 The concerns of businesses aren't lost on the city, but it's top engineer say construction has only eaten up 11 street side parking stalls on Fort Street out of 205. "The perception of course is that even a five per cent loss of parking could have a significant impact. That being said, there's a change in the way that people use the street with the bike lanes," said Director of Engineering Fraser Work. The change is on full display on Pandora Avenue where the lanes are in use, and staff at Habit coffee shop who've already been through it are preaching patience during the construction stage. 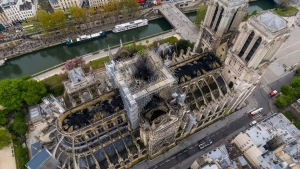 "If you can make it through that, you're going to come out better than before," said employee Japhy Japhy. "Cars are still going to come, pedestrians are still going to come, but there's now more bikes." Whether that means more shoppers on Fort Street will be known by the end of May when the lanes finally open to cyclists.